green tea: Measure twice, cut once. I ran out of wool before I could finish this little jacket. Yes, that's the knitting needle you see sticking out of the bottom edge. 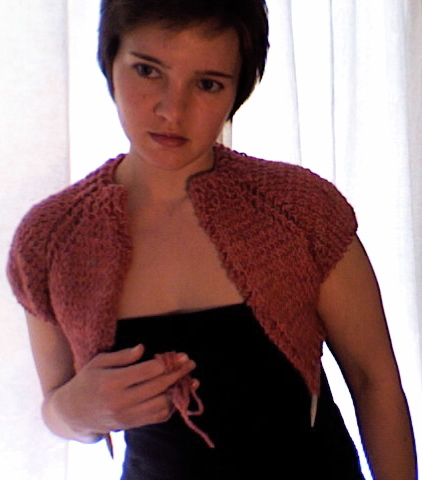 The pattern called for 150 yards of yarn, and I had 160 yards, but it wasn't nearly enough. I raced back to the wool store to buy more only to find that someone had bought all the other skeins in that colour within the two days since I bought mine. And, the colour has been discontinued, so the store couldn't order any more. Damn! I'm stuck with 80% of a garment! Thank heavens for eBay. I located what I need and now a single skien of RYC Soft Tweed in Bramble is headed my way. The moral of the story: everyone makes mistakes. Even me. Occasionally.